Description: Yandex Launcher is a smart app that lets you customize your Android phone to suit your style and needs. Launcher puts the things you use most – favorite apps, contacts, useful information from your smartphone and the internet – right at your fingertips. Yandex Launcher works quickly on all devices regardless of their generation. It won’t slow down your system, and animations run smoothly even if you’re using an older device. It’s easy to find everything you use frequently: with one simple gesture you can bring up a screen that contains all your most important apps, sites, and contacts. You can also search for anything that’s on your smartphone, in the Play Market app store, or on the internet at large. The main screen lays out your widgets so that they are convenient to work with and visually appealing. You can see time and weather info displayed directly on these widgets. 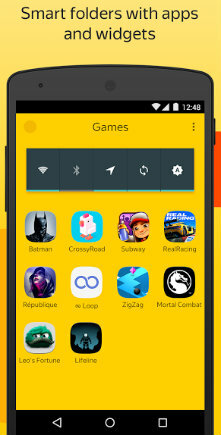 Yandex Launcher analyzes the apps you already have and recommends others that you might like. Useful apps and new games will no longer pass you by unnoticed. Once you’ve installed Yandex Launcher, you can customize the layout and number of icons on your screen, as well as choose what animation you want to play for screen transitions. All system icons are displayed using the same style, so they won’t draw your attention away from the apps that you hand-selected for your smartphone.